"Escape From Bizarro World: Chapter Two"
Three months ago in Metropolis, Bizarro finds a small girl standing on her balcony. He pushes her off and watches her fall. Superman swoops in and grabs her just above the pavement. Bizarro crashes down to the ground and hurls a flower cart into the air. He sees a school bus full of children and decides he wants to make it fly. Superman intervenes and explains to Bizarro that they can't fly, and that they aren't the same. Bizarro is confused, then he takes off into the sky. Flying into space, Bizarro crushes meteors together to form his own planet. Under the blue sun he builds his own twisted Metropolis. His eyes begin to glow and when the beam strikes his hands, Bizarro's body splits and another Bizarro comes from it. Bizarro greets Bizarro Lois, but she just screams. Today on Bizarro World, a mob of Bizarro's are angry at Bizarro Superman. Bizarro Luthor tells them that he has a plan, and shows them all a crate containing his secret weapon. Inside Bizarro's Fortress, a number of them hold Superman helpless in front of his father. He tries to break free, but they subdue him and drag him off to the prison. Other cells hold a Bizarro Mxyzptlk and a Bizarro Toyman. Suddenly the ground shakes and Luthor's secret weapon charges into the Fortress, Bizarro Doomsday. Doomsday makes short work of the duplicate Bizarro Supermen. Superman takes advantage of the distraction to free his father from the prison and fly up to the surface. As the sun comes up, Superman recoils from it. The blue sunlight will affect him in strange ways, just as he believes it gave Bizarro his new duplicating "Bizarro vision". Luthor and the mob confront Superman. Bizarro Superman crashes down and apologizes to Jonathan Kent, when Doomsday charges again. Superman prepares to stop the best, when suddenly a capsule falls from the sky and crushes Doomsday. A voice tells them not to worry, as the Bizarro Justice League emerges. Story - 4: There's a lot I could say about this issue, but in the end it really comes down to one thing. This story was fun. We have some great background interaction between Superman and Bizarro, and then some background on the creation of Bizarro World. All of that was great, but the real story gets going on Bizarro World. Bizarro Jimmy and Bizarro Luthor, with his secret weapon crate, are just fantastic, but the real fun is in the Fortress. Bizarro Mxyzptlk was probably my favorite part of the whole story, unable to return to the fifth dimension because he doesn't know how to spell. Bizarro Doomsday was a nice touch too. Although what is it with Geoff Johns and gruesome deaths? First Superboy Prime in Infinite Crisis, then Black Adam in 52, and now Doomsday is decapitating Bizarros. Finally, the second best part of the issue (and I'm sure the best part of next month's), the Bizarro JLA. Fat Flash and Smiley Batman are awesome. This was a quick read, and there really isn't too much to it, but overall it's just a fun story that is managing to use Bizarro as a legitimately scary foe, which is a nice change from his normal story. Art - 5: Apart from having heard of The Goon, I wasn't familiar with Powell's work prior to this series. I can't imagine a better artist for the Bizarro storyline. It's really hard to make Bizarro come off as anything but a cartoon, but Powell does it with flying colors. His Bizarro is incredibly creepy, while still maintaining a sense of confusion to him. His Superman isn't fantastic, it's a little too Fleischer cartoon-ish for me, but Superman isn't the star of this story so I can definitely let that slide. There's also a great action element to the art here. When Bizarro Doomsday charges in and starts tearing Bizarro's apart, it's both incredibly violent and incredibly dynamic. And no commentary on this art would be complete without a mention of the design of the Bizarro Justice League. That's some great stuff. Overall, Powell's art is definitely a little off the beaten path, but so is Bizarro, and whoever set him up on this arc deserves a lot of credit. Cover Art - 5: Haunting is pretty much the best way to describe this cover. 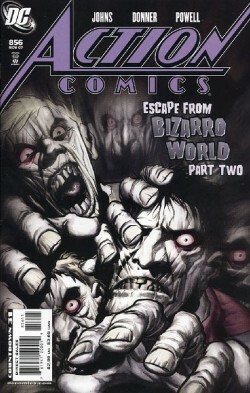 It's hard to portray Bizarro as anything but comical, but this cover really makes him creepy. Powell does a fantastic job with making the hands really come out at you. It's a great 3D effect (without the need for a gimmick 3D issue). It's a simple idea, but the execution is flawless. And as one more note, I'd just like to mention that this is both my 200th, and my last review for the site. At least for the foreseeable future as I finish up school, I do hope to be back someday. Thanks to everyone who read them over the past eight years that I've been doing this. It's been great! I'm going to miss it.